Start the lesson by asking your students how often they go to the parties. Then learn the words which mean different types of parties. Read the dialogues about different situations at a party. Finally discuss some questions about parties. 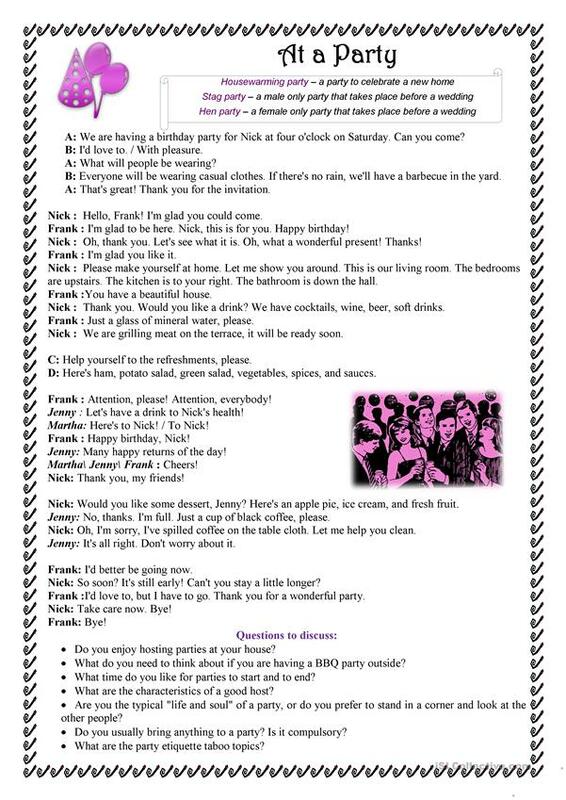 Also students can practice inviting each other to the party, offering some drinks, saying good bye etc. This downloadable teaching material is best suited for business/professional students, high school students and adults at Pre-intermediate (A2), Intermediate (B1) and Upper-intermediate (B2) level. It was designed for honing your groups' Speaking and Reading skills.